President Donald Trump has invited PM Narendra Modi to visit the US later this year during a phone call between both leaders. The White House said Modi and Trump discussed "opportunities to strengthen" the Indo-US partnership in "areas such as the economy and defence." Trump was largely positive about India during his election campaign and praised Modi for championing bureaucratic reform and economic growth. Since India's independence in 1947, its ties with the United States have been on an up-and-down trajectory. India and US had initially maintained friendly relations until 1954; Prime Minister Jawaharlal Nehru even visited the US in 1949. In 1954, US made Pakistan a Central Treaty Organization (CENTO) ally while India built strategic and military ties with the Soviet Union to counter Pak-US relations. In 1962, despite some issues, the US supported India during the Sino-Indian Border Conflict and provided arms and air assistance on PM Nehru's request. In 1963, US-based Agronomist Norman Borlaug's collaboration with MS Swaminathan resulted in India's 'Green Revolution'. In the 1971 Indo-Pak War, despite Pakistan's violations, America supported Pakistan. India's first nuclear test in 1974 contributed to a two-decade estrangement with the US. In 1978, the US enacted the 'Nuclear Non-Proliferation Act' requiring nations not included (also India) in the Non-Proliferation Treaty (NPT) to allow inspections of their nuclear facilities by 'International Atomic Energy Agency'. However, India's refusal prompted the US to end all nuclear assistance to it. In 1984, toxic gas and chemical leak at US-owned Union Carbide Pesticide Plant in Bhopal killed thousands; India's unsuccessful extradition of the company's CEO for criminal prosecution complicated the Indo-US ties further. However, India launched economic reforms that expanded its ties with the US in 1991. India's 1998 nuclear device tests ultimately damaged its relations with the US, which imposed economic sanctions on India. 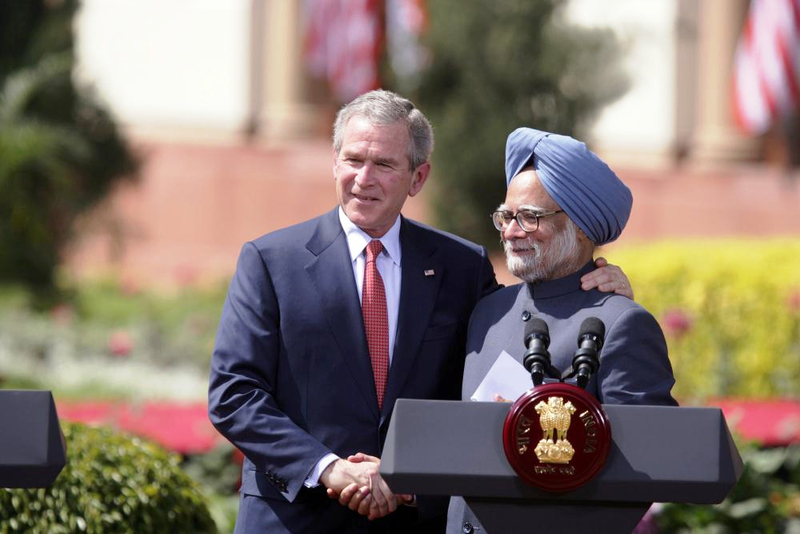 In 2001, President George Bush's administration lifted all sanctions imposed on India. In 2005, the countries signed the New Framework for establishing Indo-US Defense Relationship. In 2005, the Civil Nuclear Cooperation Initiative was approved, which lifted a 30-year-prohibition on US' trade with India. The deal was finalized during Bush's 2006 India trip making India the only non-NPT country allowed to participate in nuclear commerce. In 2010, the US and India established deeper ties through 'Economic and Financial Partnership' and 'Strategic Dialogue'. US President Barack Obama visited India and backed its bid for a permanent UN Security Council seat. In 2011, the two countries signed a MoU to promote cyber-security cooperation. Ahead of Indian assembly polls, the arrest of an Indian diplomat in the US slightly soured the ties. Trump calls India "a true friend"
In a statement on Tuesday, the White House said President Trump was looking forward to host Prime Minister Modi later this year. On Monday, Trump called Narendra Modi to offer his congratulations for BJP's recent victories in the assembly elections. Trump also expressed his support towards Modi's economic reforms and said he has great respect for Indians. She said the Trump administration "is concerned about the relationship between India and Pakistan," and "wants to see how we de-escalate any sort of conflict." She said the government wants to play a "proactive" role in the peace process. At least 12 people were killed and 30 injured when a blast ripped through a vegetable market in Pakistan's Federally Administered Tribal Areas region. Trump meets carmakers, tells them to "buy American, hire American"
President Donald Trump met the heads of America's three largest car companies - General Motors, Ford and Fiat Chrysler - at the White House.